Location: Rogers Place * 10220-104 AVE Exterior on 104 ST.
Prolific sculptor John Weaver (1920-2012) created this likeness of Edmonton’s beloved No. 99, the star who gave Edmontonians 10 years of unforgettable championship hockey before a previous team owner infamously traded him to Los Angeles. August 27, 1989, Mayor Terry Cavanagh proclaimed Wayne Gretzky Day in Edmonton, and dedicated the 950-lb bronze Gretzky outside the Oilers’ previous home at Rexall Place. 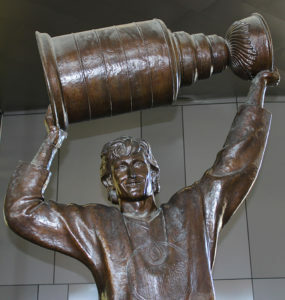 In 2016 bronzesmith Don Begg, who originally cast the work, gave the Great One a touch-up on its way to its new place of honour in time for the 2016-17 hockey season. There was little wear, but the statue needed cleaning: reporter Marty Klinkerberg wrote, “Everyone else treats Gretzky with great respect, pigeons not so much.” The statue has long served as a place for fans to meet, take photos, and even celebrate life passages. Many wedding photos have been taken with the bronze Gretzky, and more than a few times, security officers at Rexall Place found ashes scattered his feet.